Snowmobiling this season? You need to read this! Anxious to hit the trails? Who wouldn't be? With thousands of miles of trails to explore, Maine is a hot spot for snowmobiling. As the first snow storms arrive and you gear up for the season, keep these points in mind to ensure a safe and enjoyable winter of riding! Respect Landowners. Keep trails open. As you gear up for a ride, keep in mind that over 95% of Maine's 14,000 miles of trails are on private property. Private landowners have generously granted permission to clubs to establish trails on their property and they're trusting all of us to treat their property with respect. Keep Maine's trails open by riding safe, staying on marked trails only and always following the laws. Don’t alter your snowmobile's factory exhaust. Loud pipes are illegal and their noise is closing our trails. Lack of respect and land abuse are among the top reasons that private land access is shutdown! 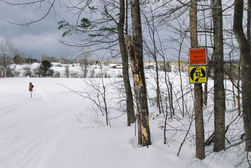 Remember that everyone who enjoys snowmobiling in Maine is depending on you to be responsible on the trails. Have a plan. Be prepared. Before you head out for any adventure in the Maine outdoors, always tell someone your plan for the day to include where you are going and when you plan to return. If your trip plans change, be sure to tell someone that they have changed. Bring a small pack to include essential items such as food and water, a means to make fire, extra socks, any needed medications, a map and compass and a GPS or cell phone. All of these items will easily fit into a comfortable pack that will add considerable safety to any trip. 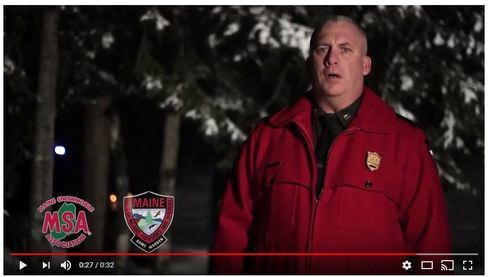 These items will not only make an unexpected stay in the woods more comfortable, Maine’s game wardens will have a much easier time locating you should you become lost.